Since I introduced you to Bruce and Mark on Monday, I thought I’d pull out the other recipe of theirs that has been lurking around my kitchen – Milk Braised Pork. I already knew that milk did stupendous things to proteins from using it to braise chicken, so it should have come as no surprise to me that milk braised pork was just as luscious. There may have been some happy dance shimmy going on at the kitchen counter as I taste tested for “quality control” purposes. I will be honest and say that I don’t yet own a single one of Bruce and Mark’s cookbooks. But if the two recipes I have made from them are any indication, there’s a lot to like in those many, many pages. Who knows, perhaps after the next round of “tidying up” the cookbook shelf, there may be room for a little something by Bruce and Mark. Melt the butter with the olive oil in a dutch oven or pot large enough to hold the pork. Pat the pork dry, season with kosher salt and pepper, and brown it well on all sides. 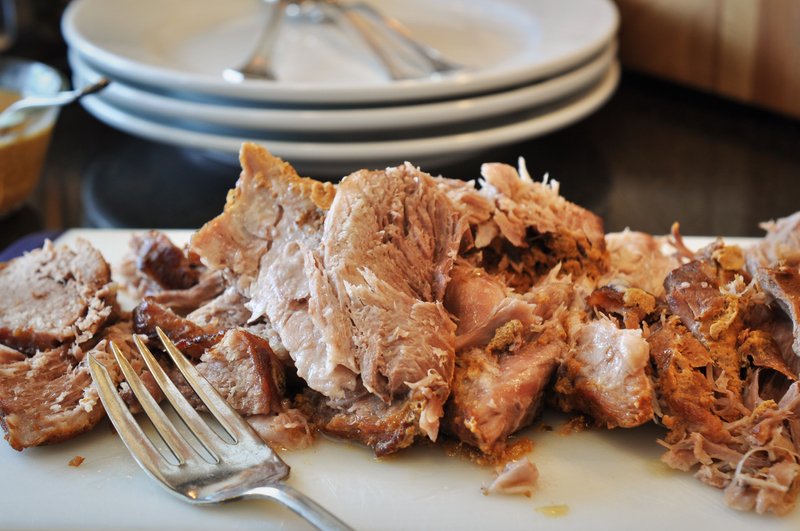 Carefully transfer the pork to a platter and remove all but a tablespoon of the fat from the pot. Cook the onion until it is softened, which will be very quick if using the butter braised onions. Add the vegetable broth and scrape any browned bits from the bottom of the pot. Add the garlic cloves, cinnamon stick, and milk and stir to combine. Bring the liquid to a boil, return the pork and any accumulated juices back to the pot, cover and transfer to the oven for 3 hours. Check the pot after 90 minutes to see if you need to add more liquid. If the liquid is getting low, consider adding more vegetable broth or a dry white wine. After 3 hours, the pork should be falling apart tender. If it’s not, stash it back in the oven and keep checking it every 45 minutes or so. When done, carefully transfer the pork to a cutting board to rest while you finish up the sauce. Strain the liquid through a mesh sieve into a bowl. Skim as much fat from the liquid as possible and transfer to a small saucepan. Set over medium heat and boil until the sauce has reduced slightly. Whisk in the mustard, if using, and taste for seasoning. Add salt and pepper to taste and serve the sauce over the tender bits of pork. I’ve always wanted to try this preparation, but I’ve always been worried about the milk–would it curdle? Thanks for setting aside my fears! Kitch, the milk won’t curdle in the sense that it gets all sour and smelly.� But the milk proteins do sort of clump up some…I remember this more with the milk braised chicken than the pork…but a quick pass through a mesh strainer takes care of everything in a jiffy. I got to know Mark through the Goaterie challenge I put on..he has just published a new book called, of all things…Goat. Nicest guy…just sent me some of his homemade jam. He’s on Twitter @markscarbrough. Tell him about your adventures! This is fantastic. Oh how I long for this taste sensation. Pork is porkalicious, my Mr isn’t a fan, so I just don’t cook it enough. Defo going to now though, this looks AMAZING! Very interesting! I have never braised anything in milk, but it seems I am missing out!